This post is dedicated to Kendall for having faith that I'd be able to do something like this. I'm a very simple cook which is completely unlike my writing style. I love food and I love trying new things, but when it comes down to it my staples are very simple. For example, I hate plain rice (white, brown and everything in between), but I love fried rice. Since we always have an abundance of rice in the house my favorite quick and easy meal is to throw a bunch of things together in a pot (meat, vegetables, spices), add some rice and other things and voila...fried rice. 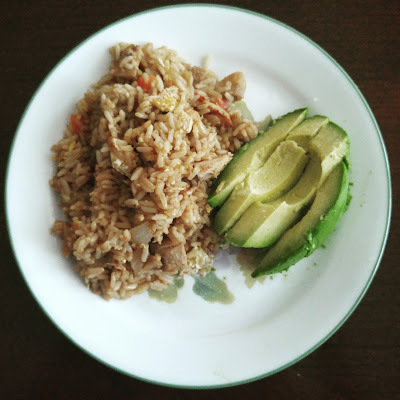 The rice we typically use is a parboiled Guyanese brown rice and occasionally we use basmati rice, both of which are okay substitutions for whatever it is that they use in Chinese restaurants. Our rice is softer and less sticky so if you make this expecting Chinese fried rice you will be slightly disappointed. Only slightly because this dish is bangin' and you'll forget about your expectations after the first bite. Going forward I'll make a better effort to use easy to acquire ingredients, but if I use what's in my fridge, which is something you won't get easy access to, I'll be sure to include useful substitutions. Also, I know it's not Friday, but I was so excited about posting my first Foodie Friday, I did it two days early. Excuse the excitement and going forward I'll be good about sticking to the schedule. Disclosure: I'm pretty terrible at measurements because I've been cooking for many, many years by the seat of my pants so I'm only good at measuring by eye. I do use measurements when I follow other people's recipes so going forward I'll try to be more aware and provide measurements as much as possible. If you need clarifications on anything please leave a comment and I'll get back to you asap. With this recipe, I made just enough for my lunch and dinner so I'd estimate that I used two measuring cups of cooked rice. I also used 1/4 of a large onion cut into small pieces, 2 teaspoons of pre-minced garlic. I suggest using what suits your taste buds. The same with the eggs. I only needed one egg because it was a small amount of rice, but if you love eggs in your fried rice use more than one (probably no more than 3). First, I heated the oil on high and then lowered it to medium heat when it got hot enough. Test it by dropping a small piece of onion into the pot. Once it starts to sizzle, it's ready. Cook the onions until it's starts to become translucent but before it browns. Add the garlic and then cook until slightly brown, but not burnt. For this recipe, you would now add the masala. It's pretty spicy so I'd suggest about a teaspoon. If you like spice and can deal with it one tablespoon is all you'll need. Masala takes a while to cook properly. First, I mix the masala, onion and garlic until it turns into a paste. I then add enough warm water to the paste until the mixture covers the width of the pan and then let it cook until the water dries out. I then add more water and repeat the process about once more (3 times total) so that the masala is properly cooked. Then add the chicken. If you use pre-cooked chicken you only need it to cook it long enough to warm up in the pan. After cooking it through, I moved the chicken to the side of the pan, added a small amount of oil, let that heat up and then cracked the egg in the pan and scrambled it. Then I moved everything over to the other side of the pan, dropped in the tomatoes (no limitations on how much you should use), cooked that for about 30 seconds and then mixed the masala chicken, scrambled egg, and tomatoes together. I then added the rice and mixed everything together. After that, I added soy sauce. I use Kikkoman's Low Sodium Soy Sauce. A few splashes should do. It's not a strong flavour so you won't ruin it by adding too much. At this point is when I taste it and then add salt. MAKE SURE TO USE SALT! As always my recipes are usually done on the fly and it depends on what I feel like eating that day that determines what goes into it. 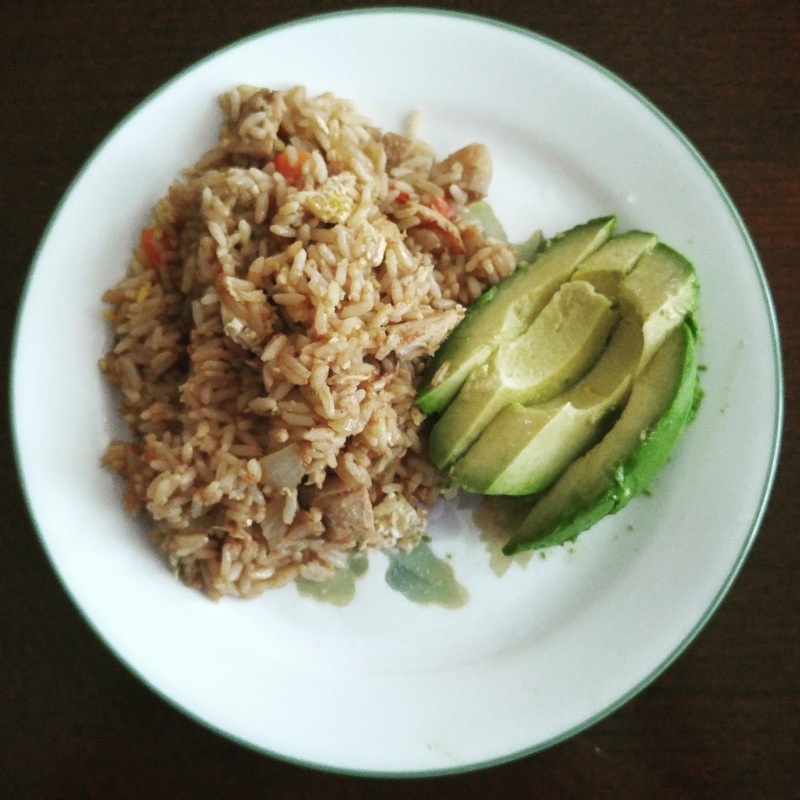 Today I had the most beautiful avocado, but I didn't want to include it in the fried rice, so a few pieces on the side with a splash of lime and a dash of salt balanced the spiciness of the rice. This is recipe is a great receptacle for loads of different ingredients. Ground beef, pork or turkey would work well here as well as Korean BBQ marinated pork or chicken which I often use in this recipe. You can buy the meat from H-Mart. Let's go shopping together if you're interested in making this recipe and want suggestions! Please let me know what you think in the comments below about the readability of the post/recipe and whether it was easy to follow. I appreciate nicely worded constructive criticism Also, you can follow the blog or sign up to receive emails so you don't miss any Foodie Friday posts.